A 30-year-old woman allegedly committed suicide after killing her two children, including a mentally challenged daughter, in the Mandawali locality of east Delhi this afternoon. 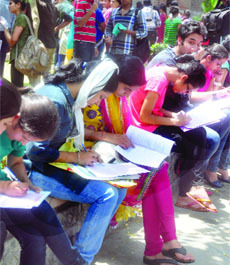 As Delhi University (DU) kicked off its registration process in all its colleges for the Four Year Undergraduate Programme (FYUP), it seemed that the online forms, available for the second year, were not a big hit among the aspirants with a heavy rush witnessed on both the north and south campuses and the designated counters. A 26-year-old Central Industrial Security Force (CISF) constable was critically injured when he sustained a gunshot wound in his abdomen after a sub-inspector accidentally fired his service pistol during a mock drill at the Rohini-West Metro station this morning. The chairman of Reliance-backed power distribution company, BSES, Lalit Jalan, today held a meeting with Chief Minister Sheila Dikshit on the prevailing power situation in the Capital. The Flood Control Order-2013 was released by the Delhi Government today in a meeting held to discuss arrangements for controlling floods during the monsoon which is expected to hit the Capital by this monthend. The incident took place following a scuffle between the woman, Sarita, and her husband, Devendra, last night. Devendra is a textile designer. The couple who married in 2005, lived with their children, Pari (5) and 11-month-old son, Rudra, on the first floor of a three-storey building in Mandawali. The alleged suicide and the murders took place at about 2.15 pm when Devendra was in office in Patparganj. Sarita reportedly telephoned him to say that she was going to commit suicide. He rushed back home and found the front door bolted from inside. His other family members were present on the ground floor. With the help of his neighbour, Heera Lal Saket, Devendra broke open the door. He saw his wife hanging from a ceiling fan. His son was lying dead on the floor. He searched for his daughter and found her body in the washing machine inside the bathroom. Saket informed the police about the incident at 2.30 pm. They reached there with a team of doctors, who examined the three bodies and declared them dead. The police began their investigations into the case. Saket claimed that the couple often quarrelled over petty issues. "Last night, they had a scuffle in which Devendra had sustained bruises and scratches all over his body. His shirt got torn," said another neighbour and former local councillor, Brij Pal Singh. Brij claimed that about two and a half years ago, the couple had approached a family court following a long dispute. However, the matter was resolved. He also said that Pari was reportedly mentally challenged and also had an impaired leg. Pari's aunt used to take her for treatment to a nearby hospital in Preet Vihar. This has happened even as the University of Delhi in order to promote the online medium reduced the cost of application forms to half for general and OBC students and made it almost free for the SC/ST students. The university administration termed the FYUP a 'success', based on the total sale of forms with 42,816 Optical Mark Recognition (OMR) forms being just in the offline mode, including 35,208 forms of the General and OBC category and 7,608 forms being sold under the SC/ST and physically challenged category. According to the officials at the end of the first day 3,724 forms were submitted without hassles. "There has been an overwhelming response to the four year undergraduate admission process today with a record sale of over 42,000 Common Pre-admission Forms (OMR) on day one. Last year the figure stood at approximately 30,000. Likewise the online registration has been welcomed by the candidates seeking admission to Delhi University. At 7 pm, the number touched 7,385 which is almost three times that of last year," said Prof J.M Khurana, Dean, Students' Welfare. "I have been sitting in front of the computer since 9 am, trying to apply for the History course, but the website has just not been working. I am worried, and don't know how long the problem would persist," said Tenzing Nyidon, an applicant from Arunachal Pradesh. Prof Avinashi Kapoor, Joint Dean of the Students' Welfare, said "There has been some technical fault and we are trying to resolve it in a few hours." The technical glitches also took place earlier between 9 am and 11 am. Deputy Dean of Students' Welfare Gurpreet Singh Tuteja said, "This is because lakhs of students hit the website at the same time, because of which technical glitches were cracked, but now it is normal and we have resolved the issues." Pooja, a student who is aspiring for B.Sc. Chemistry (H) and was accompanied by her parents to the North campus to submit the OMR sheet, said, "I could have done this by sitting at home, but I wanted to take a look of the campus." Other students did not want to take a chance by committing any mistake and so preferred to come to the university from as far as Noida and Faridabad. The CISF constable, Ritesh Tripathi, is presently undergoing treatment at the Baba Saheb Ambedkar Hospital, according to the police. He belongs to Harda district of Madhya Pradesh. "Tripathy sustained a bullet wound in his abdomen, as the bullet pierced through his ribs and went through his body. His condition is stated to be out of danger," said a CISF officer. The CISF sub-inspector, Sitaram Chahar (57), who belongs to the Agra district of Uttar Pradesh, has been detained by the police. A case of negligence in regard to the incident has been registered at the Rithala Metro police station. The CISF claims it has suspended Sitaram and has ordered a court of inquiry into the incident. The mock drill was being jointly conducted by the CISF, Delhi Police and Delhi Metro Rail Corporation when the incident occurred at 10.47 am. "Chahar had his pistol in his hand and he accidentally pressed the trigger. Tripathi who was standing nearby was injured. Chahar didn't know that his pistol was loaded with a single round. Loaded weapons are not allowed during mock drills," said the CISF officer. The police have collected CCTV camera footage from the station to ascertain the sequence of events. "Prima facie, there was no foul play in the incident. However, we are investigating the incident from all possible angles," said a police officer, close to the investigation of the case. The company was reprimanded for frequent power cuts in various parts of the city coming under the jurisdiction of BRPL and BYPL. "The consumers are more interested in round-the-clock power supply than clarifications by the BSES as they are facing the hardship due to outages coupled with scorching heat," said a senior Delhi government official. The company has been told to eliminate outages and improve their response system. The meeting was attended by Power Minister Haroon Yusuf, Principal Secretary (Power) Shakti Sinha and CEOs of BRPL and BYPL. The BSES has been asked to bring improvement in its efficiency, management and complaint redressal system. It has also been told to come out with the factual position as and when outages are there as the people have every right to know about the causes behind the outages and its expected duration. At the bulk level there is no dearth of power and the availability is more than demand. Dikshit said that the consumers are suffering due to managerial slackness of the BSES. "The state government will render its cooperation in settling issues relating to improvement in power infrastructure," Dikshit said. Jalan has given assurance of an immediate action in this regard. A meeting of the apex committee was held to review the arrangements to meet any challenge. The arrangements have been made for evacuation, rescue, relief and temporary camping sites, said the official of the government. All the agencies concerned have been asked to work in tandem to take care of the loose ends well in time. They have been instructed to be more cautious about 153 waterlogging points and also procure flood protection material. Chief Minister Sheila Dikshit said the government has constituted sector committees headed by the ministers to chalk out the measures for dealing with the problems arising out of drainage congestion. They have also been asked to keep a close watch on water level in the Yamuna by keeping in touch with the neighbouring state of Haryana and the Central Water Commission. Agencies such as Municipal Corporations, Public Works Department and Irrigation and Flood Control have been told to complete de-silting exercise by June 15 and keep their pumping stations and wireless sets well-oiled. "The boats and the divers will be made available, apart from making arrangements for rehabilitation, medical assistance, transportation and preventive measures to overcome the breeding of mosquitoes, etc.," said Dikshit. The Revenue Department has constituted round-the-clock control rooms, one at DC Office (East) and another at IFC Headquarters at ISBT, Kashmere Gate. To study the flood situation in the Yamuna, reference to water level at Old Railway Bridge is taken as the basis. The warning level at Old Railway Bridge is 204 mt and the danger level 204.83 mt. The highest flood level recorded was 207.49 mt in 1978 and 207.11 mt in 2010. The travel time required for flood water, discharged from Hathnikund Barrage to Delhi, varies between 36 and 72 hours. The first warning would be issued as soon as the discharge from Hathnikund exceeds one lakh cusec, the second warning would be issued when the discharge exceeds three lakh cusecs and the third warning when the flow exceeds five lakh cusecs.